James Rizzi was an American pop artist, painter and sculptor, an idol to children worldwide, and a superstar in Germany and Asia. He rose to fame with his brightly colored and vivid images, 3D cityscapes, prints and illustrations. The theme he was working under was simply happiness, the joy of living, and he proudly portrayed the light images of everyday delight, reminding everyone that happiness mustn’t be taken for granted and that love for life is all around us. As a pop artist, he liked to use strong bold lines, bright and vivid colors, and to let his imagination loose, not thinking too much into the form and outlines, which made him stand out among the fabricated replicas that we mostly associate with pop art. Rizzi was born in 1950, in the middle of the 20th century, in the artistic and cultural epicenter of the world, New York. His family comes from European ancestry, Italian and Irish, which gave him a diverse cultural education when he was a boy. He grew up in Brooklyn and attended the Holy Innocents Grammar School, and later the Erasmus High School. Rizzi was often described as a man of sun full character, who knew how to cheer himself up and pick up the spirits among others. After high school, he took a leap year, which turned out to last more than just a year, but the break period turned out to be very beneficial for his art and creativity. When he enrolled the Miami-Dade College, and later the University of Florida at the beginning of the hippie 70’s decade, he knew that he wanted a formal education in art, he just couldn’t decide which one he wanted, only to end by taking all of them. For the course entry requirement, he made a silkscreen print, color it and combined with matching etching which he attached on the cutout print, added a sheet of foam and made his trademark artwork combo, the mix of painting, 3D sculpture and graphic art. After college, he moved back to New York, where he found Soho district in Manhattan the best place for an artist to be and made his home there. He started hanging out with other artists in the city and participating in outdoor shows. He sold his paintings outside of the major artistic hotspots, in front of MOMA, MET Museum, galleries in Washington Square. His first creations were done in small formats, and he mastered the small-scale drawings, which he started exhibiting in the city. The first exhibition happened in 1976 in Brooklyn Museum. Later came the commission design works, and vinyl case design which he did for many discos and new wave bands in the 80’s. In New York, he was a breath of fresh air, a man who fought the darkness and melancholy with happy, eye-catching images. The first serious engagement was for a Japanese company where he worked as a designer for corporations. 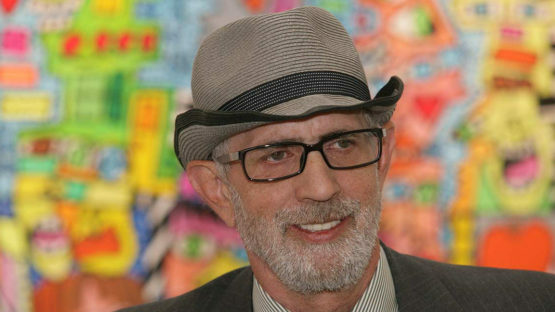 James Rizzi worked for television, collaborated with brands while working on the design packaging and made his own designs for puzzle games, flyers, restaurant menus. His most serious commission was the collaboration for the Olympic Games in Atlanta in 1996. At the opening ceremony, he displayed series of paintings, which were capturing the Olympic spirit, and later continued to burst with life at the Olympic Museum in Switzerland. His favorite place in the world was his hometown New York, where the city itself inspired him to make art. The details in his cityscapes are directly inspired by architecture, dense buildings, skyscrapers, parks, and crowds. His work is a result of mixing various influences, techniques and above all love for painting and daydreaming. He proudly stated out that his favorite artists were Picasso, Paul Klee, Keith Haring, Andy Warhol, and painters from the cartoon producing studios, who knew how to lighten up someone’s day and make imaginary worlds closer to the audience. His elaborative style crossed borders and traveled worldwide, but made him a superstar in Germany. He was the first artist ever to design postage stamps in Germany. Rizzi designed toys, boxes, gift wrappings and office interiors. He designed an oval ceiling, nowadays called The Rizzi Dome for the large shopping mall, in Oberhausen, Germany. For the Volkswagen Beetle, he painted and decorated three cars, and for the Lufthansa Boeing 757, he designed the whole exterior. 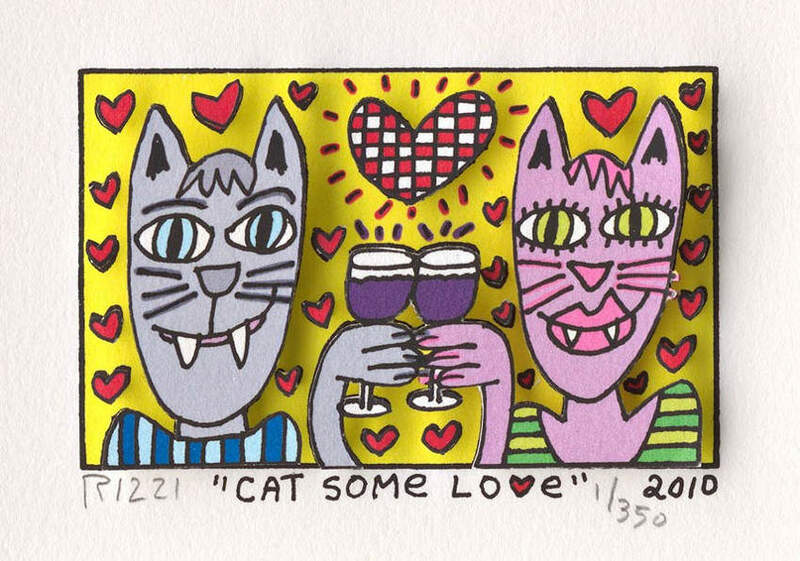 When we think about the uniqueness of James Rizzi art, we think about childhood, invitational aesthetics that do not follow the conventions. We think about urban-naive, about filling the gray cityscapes with colors and playful characters. Children and adults can relate to his artworks, so can corporations, galleries, and designers. He rebelled against formal conventions and fought against elitism and pretentiousness in art circles. He painter couples in love, children playing, fragmented portraits made porcelain and glass sculptures, and advocated freedom and flexibility. 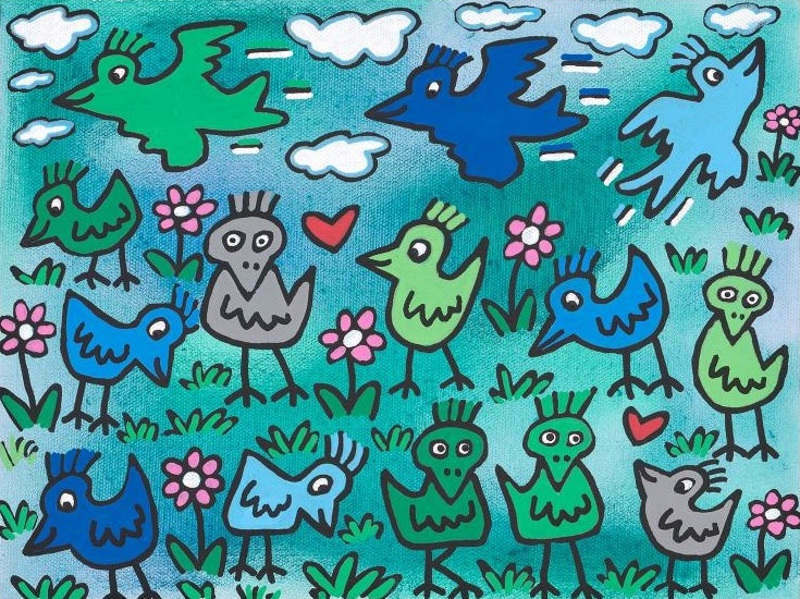 Rizzi believed that anyone could make art as long he has an open mind and willingness to learn. What separated Rizzi art from the rest is his understanding that art has to be an integral part of everyday life, to be present in the practical form. He applied his signature style to many household objects and office supplies, giving the people a chance to discover hidden symbols and the magic of colors in everyday life. Urban art mixed with naive aesthetics showed the power of childlike imagination and how creativity can transform the simple objects into the inventive artifacts. A lot of his work was done for the love of the city life, but he always tried to fight the grayness with optimism and color. He wanted to make art speak out for the lightness of being, helping people to fight the daily grind. In 2001 he designed the famous Happy Rizzi House, The Happiest House in the World, located on the farm in Brunswick, Germany. The house facade is painted in graffiti style and the whole construction is a work of urban and pop art. The five-story building was used as the office space and has been fully restored in 2011. The house is a tourist hotspot and the favorite location of children excursions. It was an inspiration for several entrepreneurs who tried to make replicas in the center of Brunswick, giving that it stands out in the sea of aged faced and concrete. James Rizzi’s large elaborate paintings, 3D cityscapes with humanlike figurines, maximalized the delight and joy of pop art. When the artists pass away, it seems that we remember them through their art. 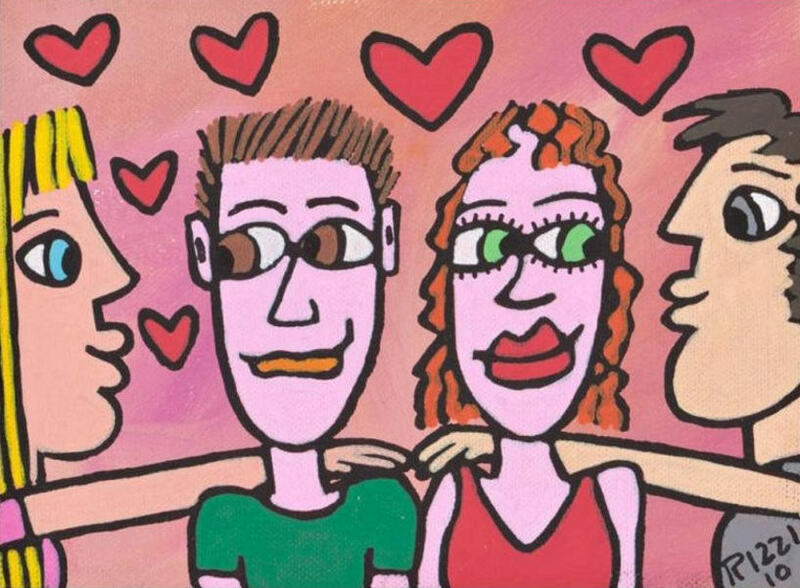 It’s funny, but when it comes to James Rizzi, we are unable to visualize any of his artworks. Not because there are so many, but because when we try, we are overwhelmed with joy and happy memories. He had a gift of inviting people to step into his world, where they would just leave all the troubles and worries behind. As if the time had stopped, and we were somewhere else, somewhere fun and care-free, drinking coffee, watching the baseball game, walking the streets of New York. And every time people went there, every time we shared Rizzi’s vision of life with the others, he was there to greet us all. Maybe he’s gone now, but his magical world of happiness and joy certainly remains.